There is no mystery to building a high performance house. You don't need unobtanium, you don't need the next greatest clever building material, and most of all you don't need to ask builders to reinvent their material stream and their business model. This is something we can do today. I've mentioned the "Swedish wall system" numerous times as we've worked on the contest house. Its no mystery - we've shown how they build their houses in multiple posts here. So it is no big reveal to show how we are using this approach in the Lagom House. The principle is straight forward - deeper studs = more insulation. 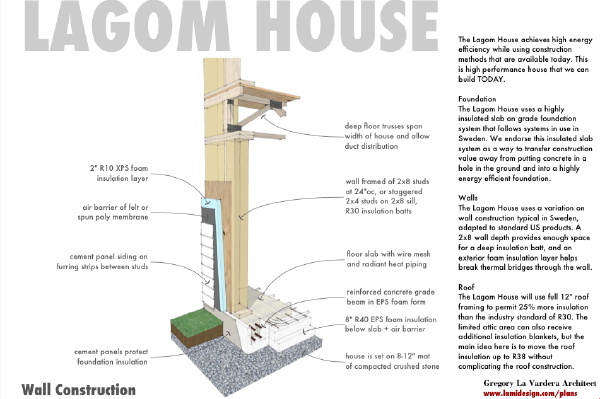 We are increasingly moving towards 2x6 studs in the US, so in the Lagom House we step up to 2x8s. 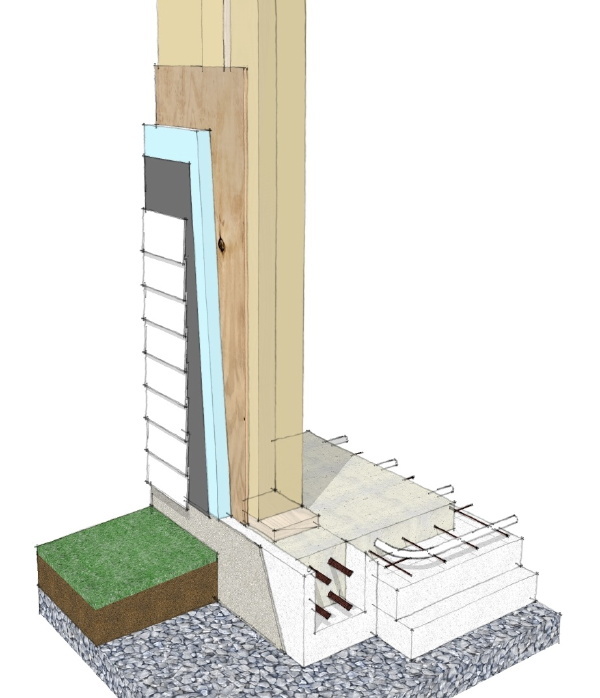 This also gives us the opportunity to use staggered interior and exterior 2x4 studs as another step up of performance by eliminating the thermal bridge of the studs. Into this wall we will cram R30 roof insulation. It will need to be compressed slightly to fit, but its the best size readily available to fill the 2x8 studs. We top that wall off with a layer of foam insulation between the sheathing and the siding, again to break the thermal bridge and raise the total R value. Total estimated insulation value - R38. Now this is not quite what is happening in Sweden. Their stud sizes are not the same as in the US and it appears they use something between a 2x6 and 2x8. Their insulation appears denser than our readily available batts. They omit the sheathing and instead are using a thick dense insulating board which appears to be able to take and hold nails from the siding. This along with heavy thick solid wood siding panels replaces the plywood sheathing that we use on our houses. This kind of panel is not available here, nor is heavy wood siding the norm. In its place we put readily available foam insulation panels over normal sheathing - nothing unexpected for the carpenters. At the foundation we employ the "super" insulated slab on grade type system that is being used in Sweden. This is not used on every house there - again this is considered a step up from their normal slab on grade preparation. But the system of pre molded EPS foam forms is the same, and you can see how this is a progression of what they do on a daily basis. The perimeter grade beam is now separated from the floor slab yet still insulated. The entire slab now receives a thick layer of EPS foam below ensuring that the radiant heat goes into the home and not the soil. Considering the way we typically build foundations in the US, and how much effort and money goes into dumping concrete into a hole in the ground, I am very hopeful that some day we can redirect that effort and money towards a highly insulated slab as we see here. How about frost and foundation heaving? This is always the concern and what has led the US to require footings extend below frost. Yet in Sweden where the winters are longer and more harsh than most of the US they build their houses without the foundations extending below frost depth. Why is that, and what are we missing? I had a conversation about this with an architect visiting from Norway where they use a similar technique. He said plainly that the ambient temperature of the earth below the frost line is much warmer than the winter air. This is well known - go down a few yards and the earth is about 50 deg, all year. Geothermal heating leverages this. Placing a home on top of the earth in fact shields the top layers of earth and permits that warmer ambient ground temperature to extend up to meet the house, and in fact prevents freezing of the earth directly under the foundation. Its plane and simple - the house insulates the earth from the cold and the natural temperature of the earth prevents freezing and heaving of the foundation. The house raises the frost line. The crushed stone bed that is laid as prep prevents wet soil and freezing from occurring directly below the slab, a well known principle even here. But why not use SIPs, or ICFs, or straw bales, or any other number of promising building tech? Because 99% of the people building homes right now have never worked with any of that stuff. If they do it forces them to work with new suppliers that they have no track record with, it forces them to estimate time and schedule for work they have not done before and don't know how long it will take. 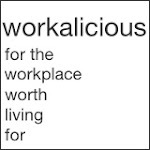 It forces them to work with new subcontractors and learn new techniques. In the long run all these things are good, but in the short run it makes houses more expensive and greatly slows the distribution of energy efficient construction. What we are outlining here preserves all of the know how, the supply train, the business relationships, everything that is already in place. 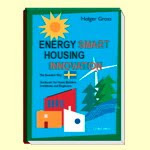 We already know how to do this, and we can begin building homes with near Passive House performance right now. So there it is, a strategy for building high performance houses, TODAY. What are we waiting for? Great informative post and have a couple of questions for you. 1. Why did you decided to pull the water barrier to the outside of the ridgid insulation? In EIFS systems we typically place this on the wood sheathing or when buildings don't provide sheathing it is applied directly to the studs (cheap I know!) 3. That footing appears undersized and wouldn't it extend inwards further. I don't quite know what I think about structural footings bearing on EPS foam. I'm interested in doing some research on the subject. Thanks for the info. Hey Jake, thanks for dropping in at the blog. 1. The amount of control I might have with a set of stock plans is questionable, but I choose the outward location for the water barrier simply because it is the last line of flashing in stud construction. Trim flashing, base flashing, everything tends to lap under the water barrier so I prefer it to be right behind the siding. Not the same as EIFS which is a stucco like finish that goes directly on the foam. 3. I am not sure of the density of the foam they use for the pieces that lap under the grade beam but I suspect that it is denser than your typical EPS foam. And as far as the grade beam being undersized - no, I don't think so. Not when placed on a bed of compacted stone. For instance look at the Superior Wall precast basement wall system. It bears on a stone bed, and the precast wall is only 6" wide. What is not shown in this drawing are wire ties between the slab and grade beam that would prevent movement that would separate them. There are thousands of houses in Sweden, Denmark, Norway, and increasingly in the UK where slabs sit on EPS foam. Old habits die hard, I know, but we really have to take our heads out of the sand. Yeah, question 2 ended up being merged with my comment on #3. I agree, EIFS is a bit of a different animal. In my area we don't typically get into too many projects with siding or rain screens but I think that the trend is to become more generally accepted (here). I guess the rigid insulation threw me for a second as you don't typically see it behind siding; or at least I haven't typically seen it. I agree with your comments on old habits; they do die hard. I don't think there is a right or wrong way - some rain screen systems definitely put the insulation over the water barrier. But I'm not trying to make a rain screen here. That's an entirely different animal. The siding can have some space behind it which will promote drying and venting if water gets behind, but its closer to a normal siding install than a rain screen. I really like the idea of super insulating using common materials and construction techniques. What about using this wall system with a house built to one of your stock plans, namely the Plat House? Would that constitute a new design and require a custom set of prints, or could one specify this wall system with the builder, while using the stock plans? John, you could really go either way. If you want a set of plans that shows all of this, and makes it clear to the builder, than yes - you can hire us to adapt the plan set to show this. Or you can get the plans stock, with the intention of altering them as you build or altering the design with your builder to incorporate the greater insulation. If you go this route and purchase plans I'll be glad to talk through the areas I would expect to be impacted by the changes. Not sure if you are as much of a magazine whore as I am, but several years ago (wait, I'll find the issue...#179, spring/summer '06) Fine Homebuilding did a decent write-up on building a high-performance spec house, and included a good, annotated wall section detail...which I think is what your stock plans project is really all about. They took a slightly different approach than the one you've outlined here; they used a balloon-framed wall of 2x6 and created a ledger, and notched the framing at the second floor (odd, I think) to accommodate the floor framing. This effectively inset the framing to the inside face of the wall and eliminated the typical bridge that platforming creates at each floor. Pretty good, in theory anyway. They then increased wall thickness, and R-value of course, by running furring strips perpendicular to the studs on both faces (not sure of what this does to shear resistance since the studs don't have nearly the same contact area with the outside sheathing), thereby allowing more insulation depth while simultaneously reducing the bridging area. They used an insulated concrete form for the foundation wall too, but it was far more conventional, in that it was intended for a full basement design (favored by almost all of us in tornado alley). There were a few other details on the wall too, and I'd urge you to get a paper copy or their comprehensive CD on the entire FHB series, and give it a once-over, just to see what some others are doing. It's a decent magazine, and written from the perspective of the builders and tradesmen, and not the designers, and they seem remarkably amenable to these types of alternative building techniques. They're out there, you just have to find the right builder. Overall, I'm right with you about your opening statement; none of what you are proposing is a money drain on materials (wider sills and plates, very cheap investment), nor doing anything that is necessarily more labor intensive or require any special tools beyond what is already standard fare on a typical site. No real re-learning anything and no re-inventing the wheel, just doing what is already done, slightly differently. I've cut way back on my magazine habit, but I used to be a Fine Homebuilding subscriber. Not sure if I have 179, but I'll check that shelf. I appreciate your description of these details though. I thought about delving more into variations on standard platform framing, but decided to at least do the drawings for a more straightforward full depth stud. But this is why on the drawing I describe the option for an interior and exterior stud line on the 2x8 sill. Along with this the floor joists could bear on the inside studs and prevent the floor system acting as a thermal bridge. Perhaps when I do the Construction Prints I can do an alternate wall section for this construction, there by leaving the choice to the plan customer as to how far they wish to take it. I love a good wall and foundation construction post. You've got some beautiful details here. Those Swedes sure know what they're doing. I have a couple cost reduction suggestions for the walls that we've considered. First, Dow makes most of their XPS insulation products to double as a WRB. You could eliminate your air and water barrier shown simply by taping the seams of the exterior insulation. It sounds a bit odd, but the Building Science Corp guys have been doing it for years on their super insulated homes. Second, you could further reduce thermal bridging and increase insulation with two 2x4 studs with a gap in between rather than a 2x8 wall. No need to have one shared sill plate. Just have the crew build two separate 2x4 walls. The beauty of this is that it doesn't matter if your studs are staggered or not and you can rest your second floor deck on top of the interior 2x4 wall without notching or sacrificing insulation value. Lastly, I'm hoping the days of traditional batt insulation are coming to an end. Blown-in cellulose or fiberglass is much more efficient and the price is coming down every month. The cost is approaching traditional batt installation now. You won't have any gaps in insulation around outlets, switches or other obstacles and the entire interior of your wall assembly will act as an effective air retarder. Take 'em or leave 'em. These aren't my ideas, but the best of what I've seen from spending countless hours researching the best of the best in the business of super insulated envelope design. Great tips Chad - thanks for that long post to list them! I have been interested in this area for a while, there are a few good references available which provide precedence for a shallow insulated slab. It is hard to argue with HUD a perennially conservative organization when it comes to building. Depending on where you are, I think adding the outside perimeter foam would be worthwhile, particularly where I grew up in northern Vermont. I've known of Legalett but some friends had difficulty getting detailed info from them and felt they were more interested in their slab heating system. But you raise the whole question of frost protection. I can't really say that I have the answer, but the indication from Sweden and my contact from Norway says that the horizontal "frost protecting" insulation is not needed, and in fact they are insulating their slab from the soil where your linked resources suggest to rely on the heat loss from the center of the slab to warm the soil and prevent freezing. The Swedish prototype suggests that the latent geothermal heat is sufficient when the house is in fact protecting the soils from the ambient air temperature. This has not been tested by HUD or anybody in the US that I know of. I've not seen test information from these other countries but I would assume it was done before these models were adopted and widely used. This is research I still need to carry out. Now all of this discussion is under the assumption that the soils you build on are suitable for this kind of foundation system. If the soil type on a give site is more prone to heaving, and/or the water content of the site is high other cautions will have to be taken. Indeed, Legalett is more interested in selling the infloor heating systems, but in many ways it would be a desirable feature in any case be it hot air like the Korean ondol (k'ang) or embedded water pipes. My links were more in support of the Scandinavian model (and your concept) than in suggesting an alteration in the application. Some of the solutions do suggest not insulating away from the perimeter, and the logic there relates to seeing it as additional storage mass and reflecting unreliable/intermittent utility delivery. The idea being should per chance the heating system fail (electricity or mechanical interruption) or one be away (if relying on wood) for an intermediate period the house would be unlikely to freeze up. I think its a matter of looking at the whole system and how the occupant lives. The more rural the setting, the more likely you are to find individuals whose focus differs from the western constant heat model. I would look at the horizontal insulation outside the perimeter as the suspenders to go with your belt. Holding the frost line well out from the edge offers more opportunity to keep any moisture in the ground from freezing or being able to drain away even in the midst of winter. I guess growing up in a climate where frost does reach 6 feet down in the course of an average winter colors one's perceptions. Remember that in Sweden and Norway the frost conditions can be just as severe as the worst winter locations in the main 48 states. No doubt the skirting insulation helps, and yes - in some more mild locations like in my region around Philadelphia the skirting is typically not even required to achieve the frost protection. But I see the big question being whether it is really needed at all. Not that there is anything wrong with better performance in this regard, but it is also an extra expense in materials, and in labor and effort to install properly. One of the most fascinating things about the Swedish construction method is how expedient it is, particularly from the slab prep up. After the stone is down the foam forms go in place and remain. There is no careful back fill process, no placing of additional material before the part of the work can be completed. This makes a big difference in cost and the likelihood of a new process being widely adopted by a market that always seeks the path of least resistance. The research is out there. We have to dig it out and shed some light on this.